I have debated if I should or if I shouldn't do a review of all the burger establishments particpating in the PEI Burger Love campaign, after all, I did it for Downtown Charlottetown Inc's WinterDine. I have had all kinds of people ask me if I will be and suggested I very well should; however, I don't wish to turn this into a food blog. That being said, today was the launch of PEI Burger Love. A successful partnership between government, industry partners and private business. Shortly after attending the launch, I was invited out to lunch with two beautiful ladies to enjoy the "Not'Cha Burger" at Gahan House in downtown Charlottetown. The service was definitely up to par and exceeded my expectations. The server did a great job ensuring we were being looked after. The burger itself was a delicious burger. 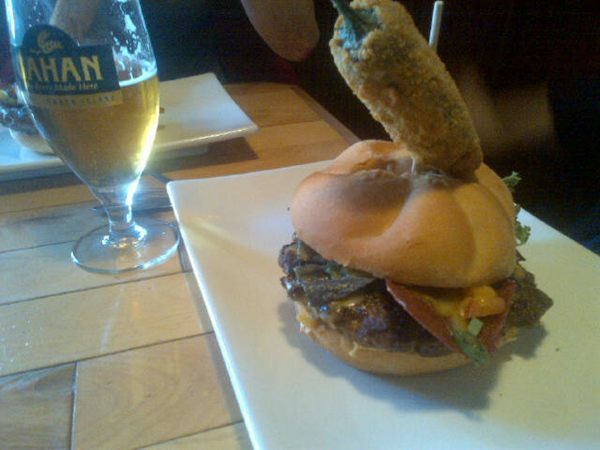 As much as my twitter followers will know I love the newly opened Relish Gourmet Burgers, I will have to give credit to Gahan for creating a better burger. The burger was a beautiful combination of both nachos and burger. The mouth watering meal in itself was very filling. The delicious juicy burger kept me full all afternoon. I combined the burger up with a simple pop for my beverage. In total, the bill came to $20. A pretty expensive, but delicious burger.